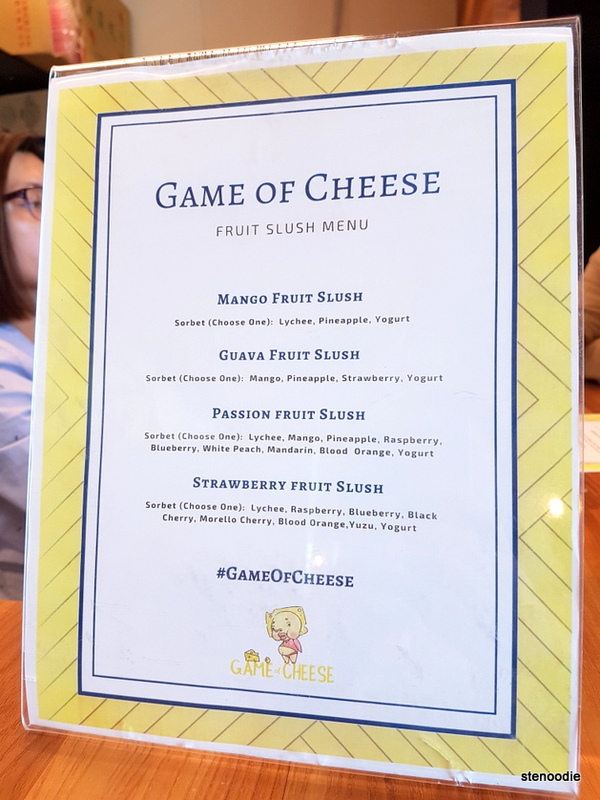 This past Saturday, I was invited to a new restaurant called Game of Cheese as part of their Grand Opening which included a dinner tasting menu where we were able to try some of their cheese-inspired and Asian Fusion items. 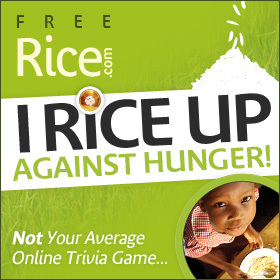 Game of Cheese comes from the invention of Chef Frank Liu, the head chef of KaKa All You Can Eat. 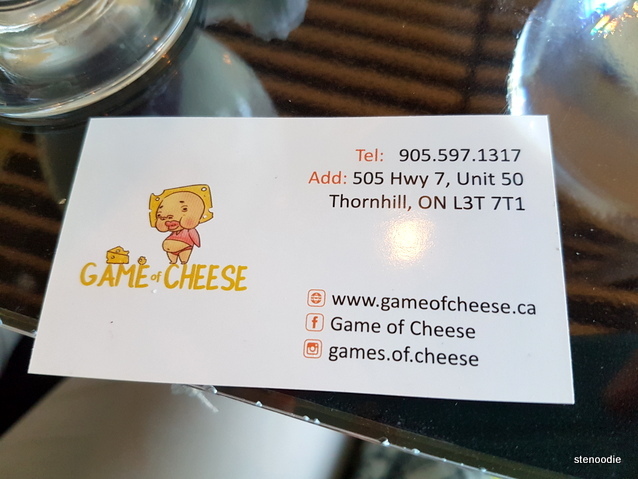 Game of Cheese is located in the ever-popular (and perpetually changing) Commerce Gate plaza on Highway 7 and Commerce Valley in Thornhill. 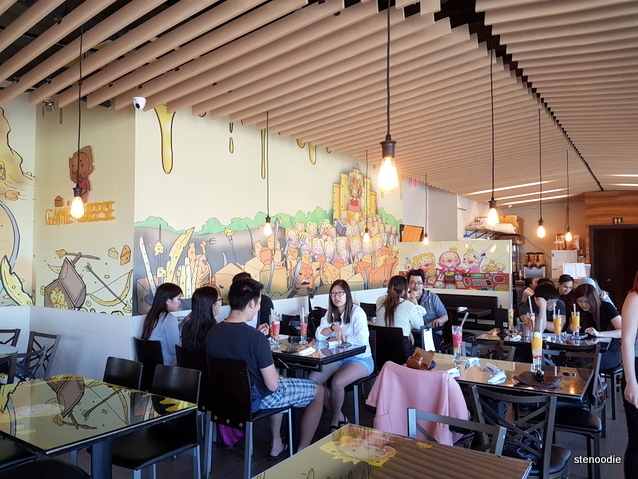 It takes the place of a previous hot pot restaurant, previous Hong Kong style cafe, and two different previous fish noodle restaurants (I know; I’ve personally been to these all previous restaurants before XD). Sweven Media was the organizer and host for the event. First, we were treated to any of the four drinks on the Fruit Slush Menu. I started off with the Mango Fruit Slush. 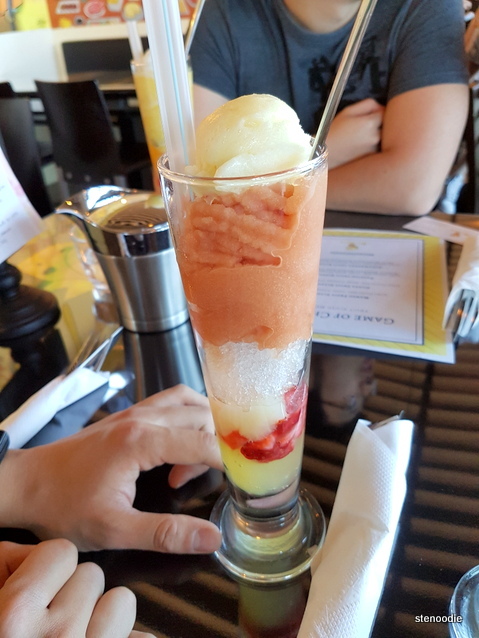 It was presented in a nice tall glass with a mixture of ice and chopped-up strawberries and syrup at the bottom of the glass which you could mix together with the mango fruit at the top of the glass. 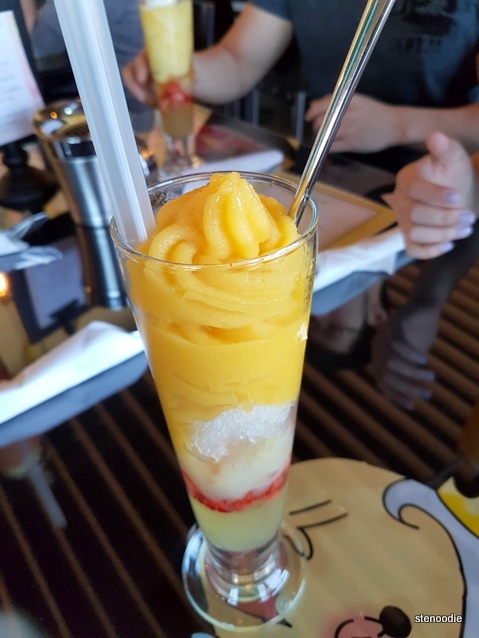 It was a luck of the draw but my mango fruit slush tasted a bit bitter; not uncommon for the mango fruit in general. I tried the Guava Fruit Slush that Ken got. 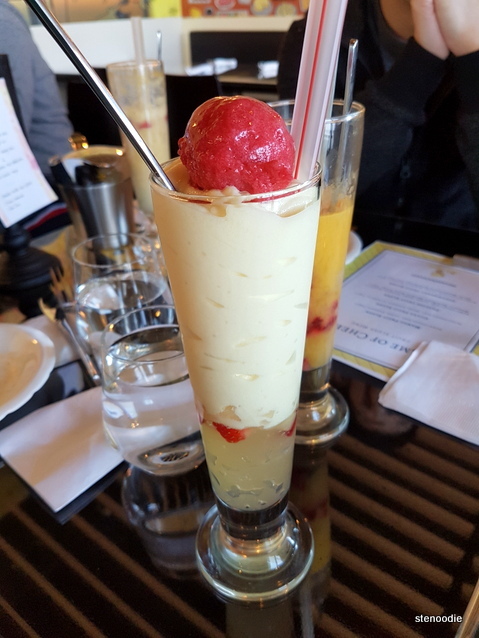 He also had chosen a pineapple sorbet to top his drink. The guava and pineapple sorbet were quite good! 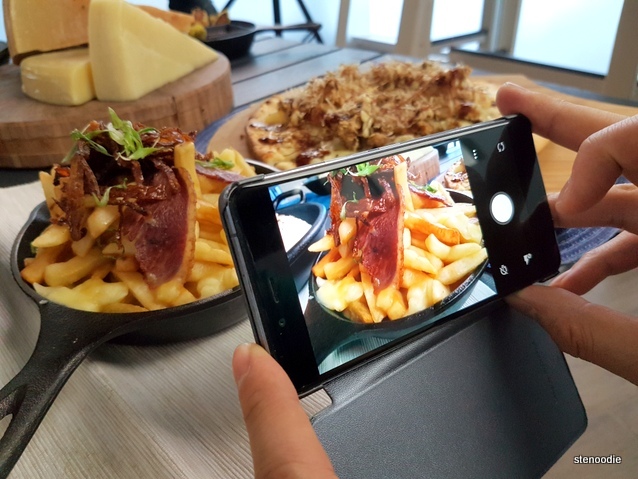 Before the tasting began, we were welcome to take photos of the pre-made dishes in a dedicated photoshoot area. We were treated to beautifully created pizza, pasta, and appetizers to photograph. 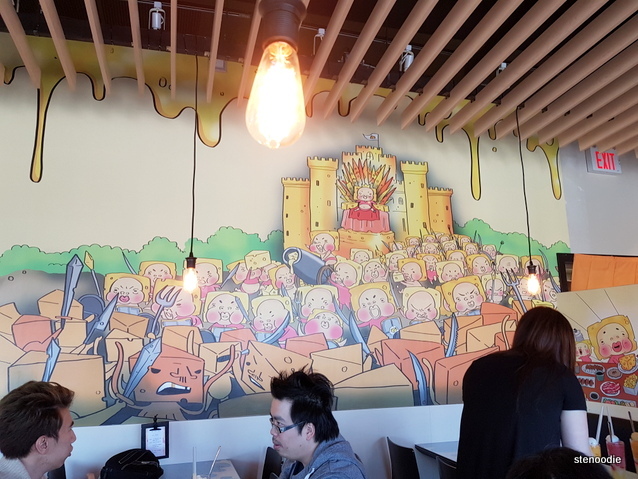 The walls of the restaurant were covered with unique drawings of the logo and mascot for the Game of Cheese which all involved cheese, cheeseheads, and cheesy foods (designed and drawn by Evelyn of @eveyxfoods). It was mesmerizing to say the least since there were so many details on the murals! 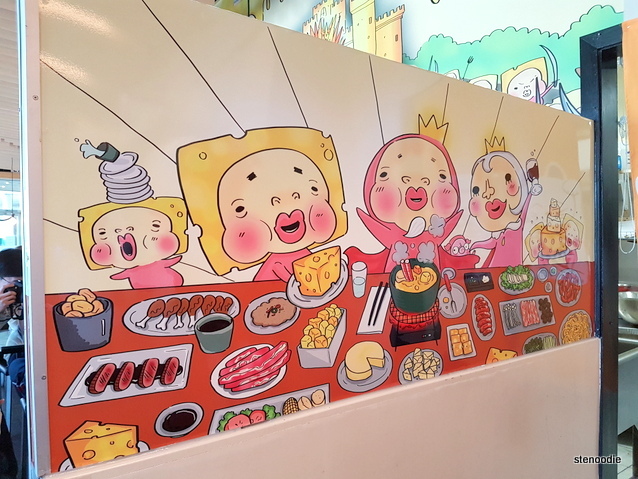 It made for a casual and fun atmosphere when you are at the restaurant since the cheese characters are cute and memorable. 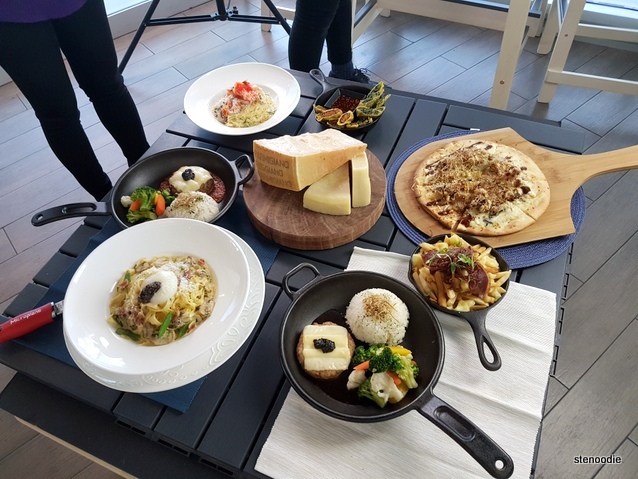 After a brief introduction and official welcome to the restaurant, we were treated to three live cooking demonstrations by the very own Chef Frank Liu before the actual tasting commenced. First, Chef Frank demonstrated how he made the Shrimp Tempura Pizza. 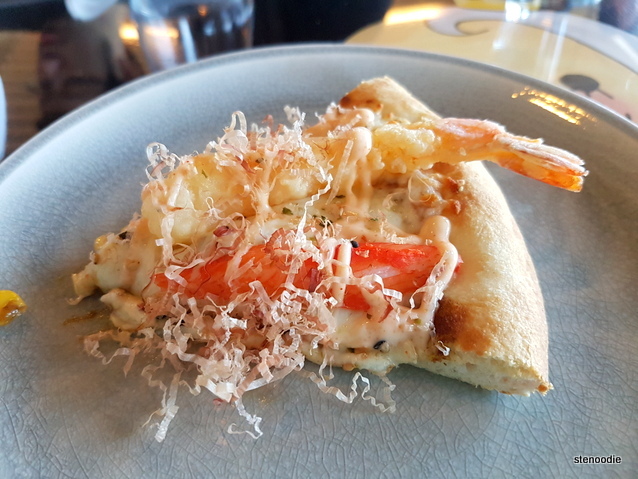 You could tell Chef Frank’s passion and dedication into his craft because he was lovingly focused on the steps and process in making this Asian fusion Shrimp Tempura Pizza. 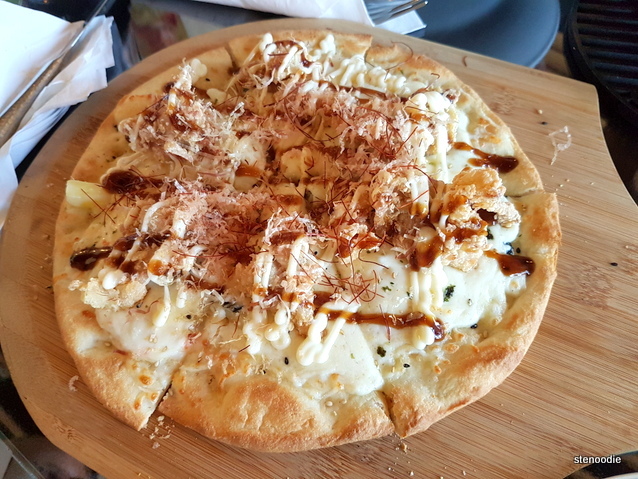 From the premade dough, he covered it with garlic oil, smeared curry sauce on it, added wasabi salt, seasoning, tempura shrimps, high quality crab meat, cheese, and mayo on it (don’t quote me though! :D). 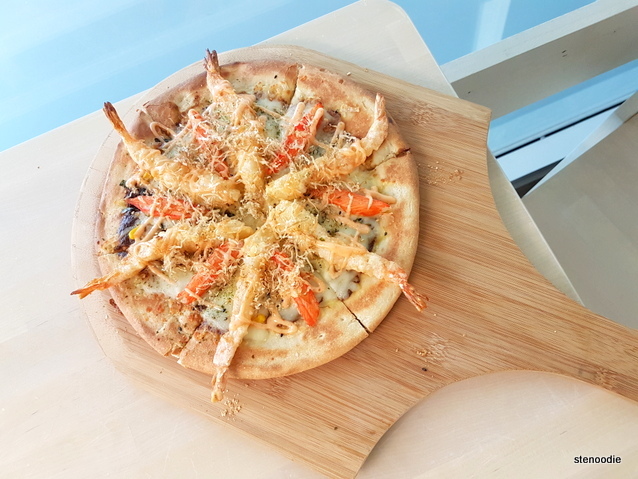 We were able to try this Shrimp Tempura Pizza fresh from the kitchen. The servers gave us each a slice to try. This was delicious! The curry sauce at the bottom of the ingredients made the pizza flavours tie together into a definite fusion that I’ve never had before. It was so good. The tempura shrimps and crab meat were a great fit to the pizza too. 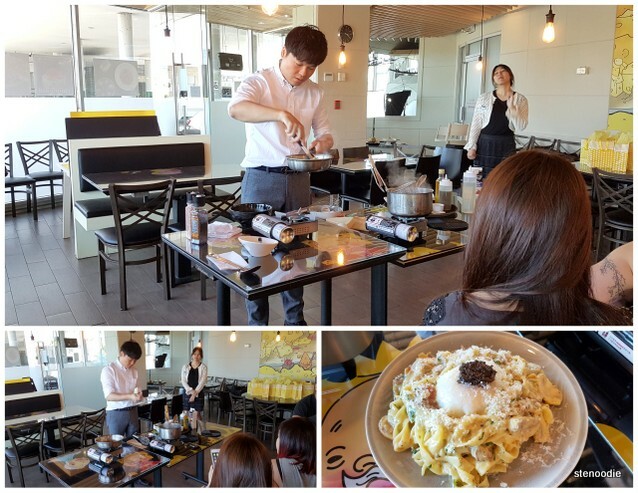 The second cooking demonstration was for the Black Truffle Carbonara. Again, Chef Frank concentrated on showing us how he created this dish by making the pasta sauce with egg yolks and milk, boiling the pasta, mixing it together before adding in a fresh spring egg (the spring egg is delicious — I remember loving it at my first visit to KaKa), and black truffle to top off the dish. It smelled absolutely delicious as he was making the dish and made our mouths water. 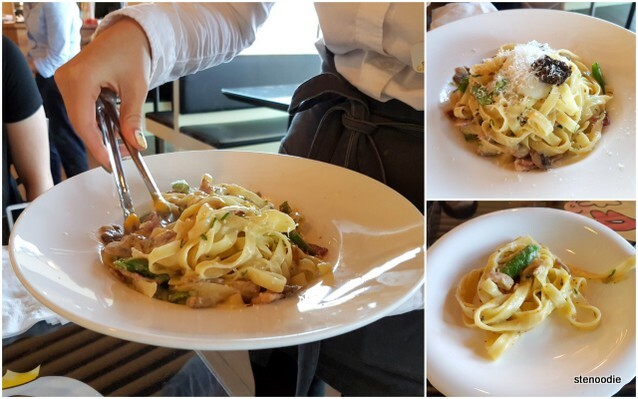 Again, like the pizza, we were treated to a sampling of the freshly made Black Truffle Carbonara after the cooking demonstration. I enjoyed the sauce on the pasta; it tasted strongly of egg but was thin and didn’t made the pasta stick together. It was different than other pasta sauces I’ve had! 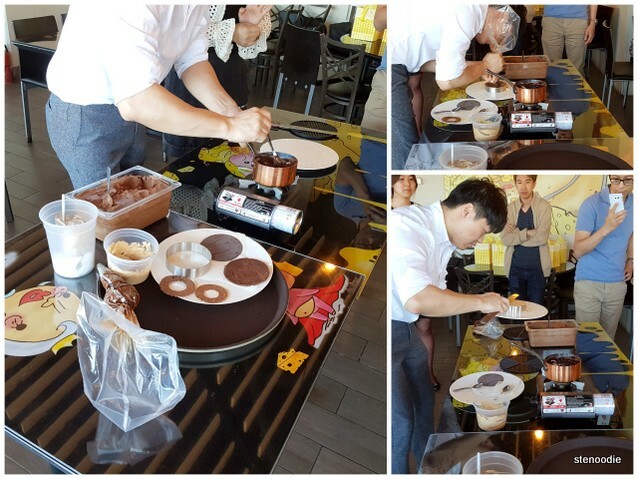 Thirdly, the last cooking demonstration was for the Chocolate Truffle Tart (I actually didn’t even know that we were going to be treated to watch three cooking demos; I thought we were just watching one!). Chef Frank prepared all the various layers of the Chocolate Truffle Tart and demonstrated the care and detail he put into the rich chocolate dessert whose appearance can pass for fine dining. There was rich chocolate cream, double churned cream, a chocolate base, and a chocolate covering at the top (again, don’t quote me). Upon finishing it, he asked us if we wanted to try it first or begin dinner. Although I wanted to begin dinner first, the majority seemed to want to try the chocolate dessert first so we waited 10 minutes for the Chocolate Truffle Tart to set in the fridge before we were able to try it out. Mmm! It was incredibly rich and creamy. One bite was more than enough for me at that point. 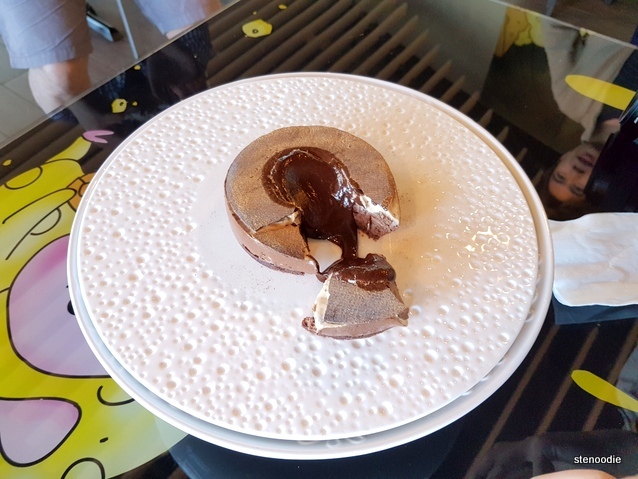 The quality of the chocolate used in the dessert were definitely high and contributed to a rich and strong chocolate dessert ideal for sharing. Finally! We were able to start the tasting menu!! All of our appetizers arrived all at once. 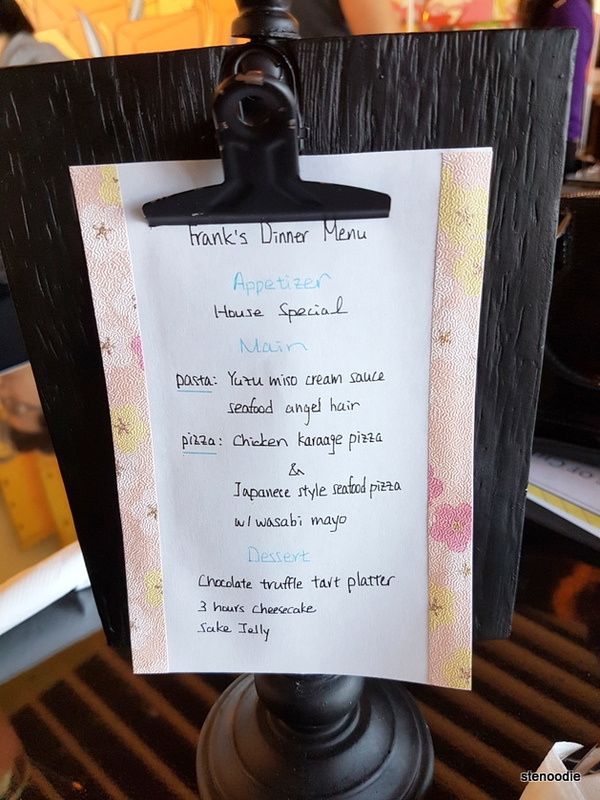 I think the kitchen had these all ready for us but since the cooking demos weren’t done yet, everything sat under the heating lamp until we were ready (…!). The Korean Style Seaweed with Korean Spicy Soy (sauce) was served in a skillet. These were bunches of vermicelli wrapped in seaweed and then thrown into the fryer accompanied with some definite spicy soy sauce. I liked the crunch and spice of this. 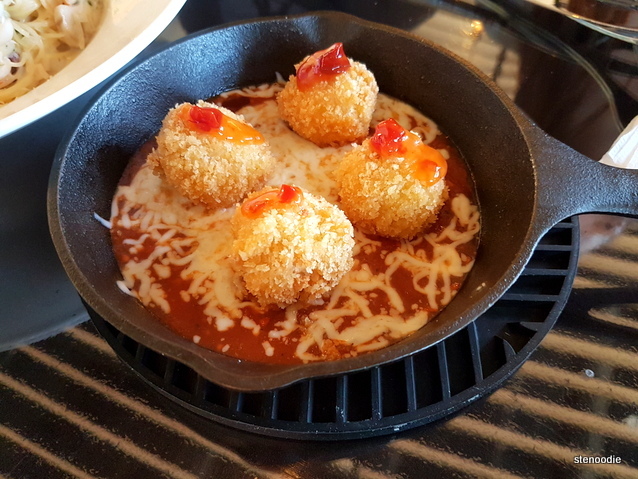 The Arancini Balls with Spicy Tomato Sauce were fried balls of cheese that were also served on a skillet with some tomato sauce and melted processed cheese. Our first pizza dish also arrived at this time. We were served the Chicken Karaage Pizza which I thought was a genius invention! 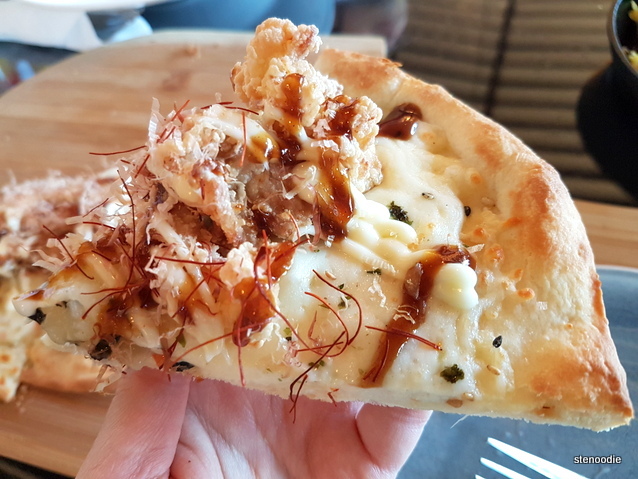 I love chicken karaage and to put it on a cheesy pizza was so smart! I really liked the chicken karaage on top of the pizza; it was very nicely seasoned and in good sized pieces. The pizza also contained some pineapple chunks with cheese and cream sauce. 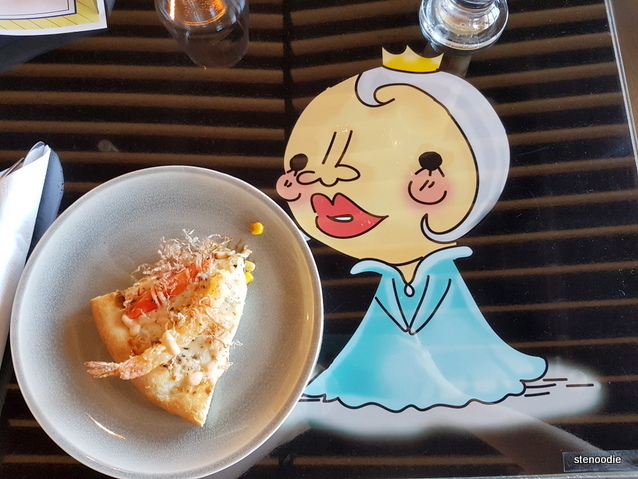 Overall, it was a very good pizza but a lot of us thought that when comparing it to the first pizza we had, the Shrimp Tempura Pizza was still many people’s pizza of choice. 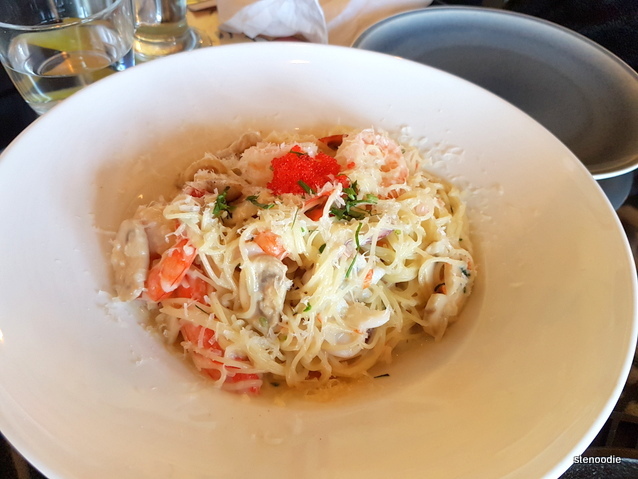 The Yuzu Miso Cream Sauce Seafood Angel Hair Pasta was really good! I would go back for this one. I like angel hair pasta in general (I actually haven’t had it in a long time) and this was done well with the seafood and cream sauce. The seafood included tempura shrimp and high quality crabmeat again (like the first pizza). 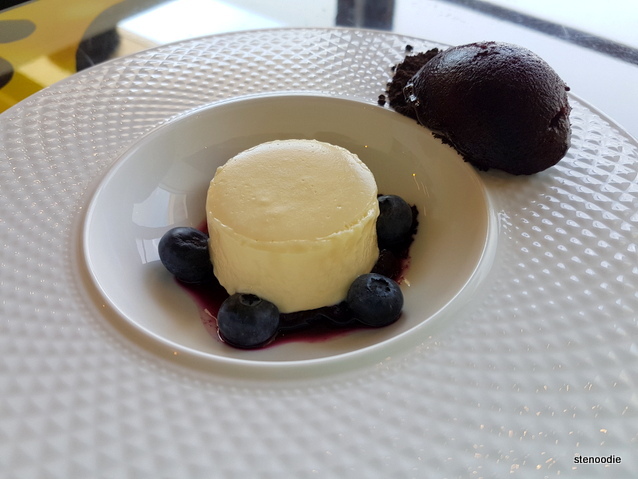 The 3 Hours Cheesecake was served with berry compote and a serving of raspberry sorbet with some chocolate crumbs on the side. I was the last one to try the cheesecake which we shared among the four of us and so I might have been influenced by everyone else’s reactions to the cheesecake (XD) because when I tried it, I thought it was really good cheesecake that was strong in cheese flavour. My three companions all thought it was super strong and reacted physically towards the unexpected “cheese bomb” flavour in their mouths. I just thought it was really good cheesecake. 😀 The raspberry sorbet on the side was a good side to the creamy cheesecake. 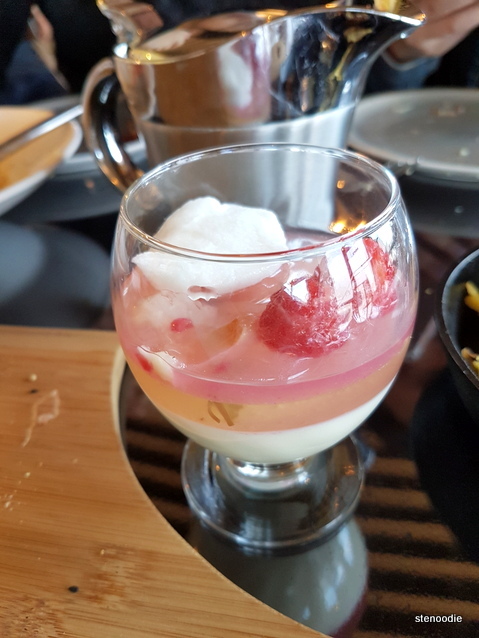 The Sake Jelly was first served to us without the sorbet but later corrected to include it. The sake was strong in the jelly dessert for sure. 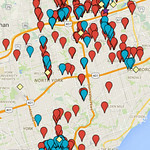 The event stretched from 2 p.m. to 5 p.m. in total. They had originally expected to finish up by 4:30 p.m. 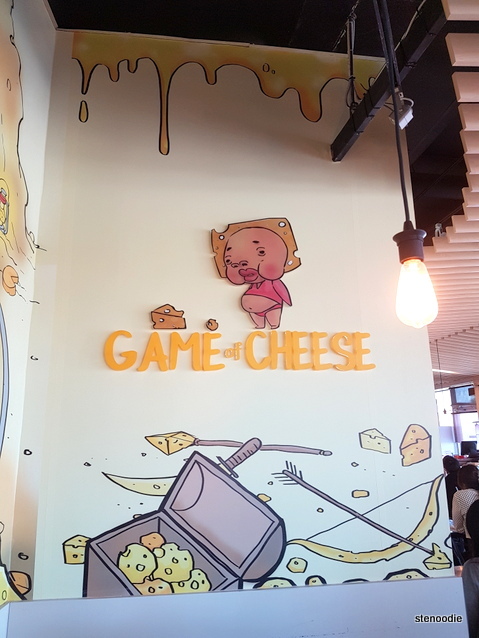 Thank you Sweven Media and Game of Cheese for inviting us to your restaurant for your Grand Opening and tasting!! 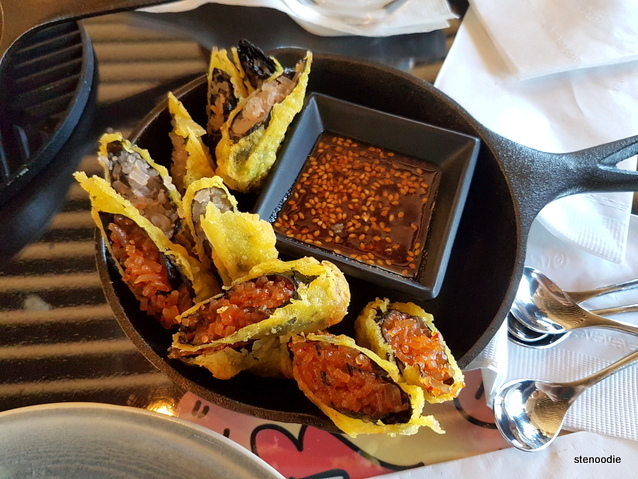 I was really grateful to be able to try out this restaurant and all their dishes as part of a tasting ever since I had heard about this restaurant through the grapevine when it first soft opened about a month ago. 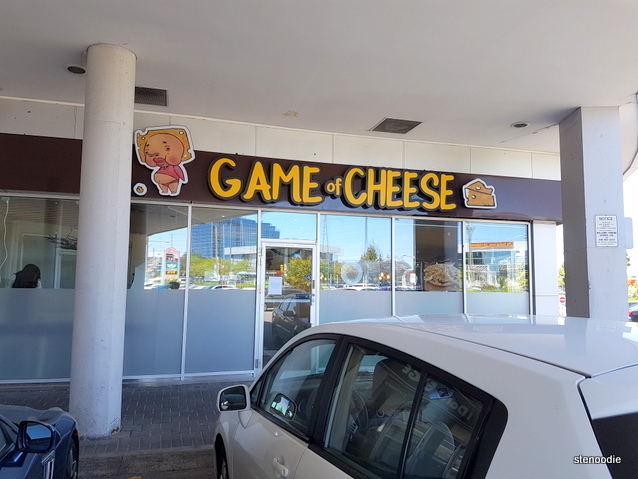 FTC Disclaimer: Although Sweven Media and Game of Cheese invited me to a complimentary tasting, the opinions expressed here represent my own and not those of the companies. This entry was posted in Complimentary Adventures, Food and tagged 3 Hours Cheesecake, 505 Hwy 7 Unit 50, @GameOfCheese twitter, Arancini Balls with Spicy Tomato Sauce, Black Truffle Carbonara, Chocolate Truffle Tart, Commerce Gate Plaza, food blog, foodie, Game of Cheese, Game of Cheese Grand Opening, Game of Cheese murals, Game of Cheese pizza, Guava Fruit Slush, Korean Style Seaweed with Korean Spicy Soy, Mango Fruit Slush, newly opened in Markham, Passion Fruit Slush with Raspberry Sorbet, reviews, Sake Jelly, Shrimp Tempura Pizza, tasting, Thornhill, Yuzu Miso Cream Sauce Seafood Angel Hair Pasta. Bookmark the permalink.